February 2011: PhotoRant+ Panasonic Lumix's advertising slogan didn't last long -- not, I think, because there would soon enough be a Lumix-branded mobile phone, but because it's a slogan that can easily be interpreted either way: that a celphone is less than a camera, or (oops) that a camera is potentially rather less than a cameraphone. It's also less than a "camera-puter," which is an aspect that is neither camera nor phone. In the simplest sense, the camputer is a portal for images direct from your hand to the internet. But what about pictures before they ever leave the phone? If they ever leave the phone? The utilitarian camera-as-scratchpad notion that's been spreading since the advent of home video (even, for a few, on Super 8) is now something that almost everyone takes for granted. End a meeting with a whiteboard full of scribbles that might be useful later? No time to copy them in a notepad? Use the camera phone. Want to keep a snap of the good-for-once haircut? Want to remember that the car is parked on Level 4 Blue zone? Easy and the photos just as easily cast off when they're done. Camphone as agent of political change? The jury's out on its genuine effectiveness, but certainly it's had a huge and unpredictable effect on the relations of people, governments, politicians, and the media between them. Beyond these "useful" applications, though, and beyond the camphone's replacement of point and shoots for a quick facebook-upload fix -- are there new ideas that might be useful creatively? The rapid spread of programs like Hipstamatic and Vignette (or even CamScanner) provide a hint to one other direction, closer to usual photographic practice -- the collapse/reversal of the traditional photo workflow. Sure, you could already take a digital photo and then push it through Photoshop to alter the character of the color and contrast, emulating the look of a particular film stock. The patterns were still the same: capture, process, and (potentially) presentation. 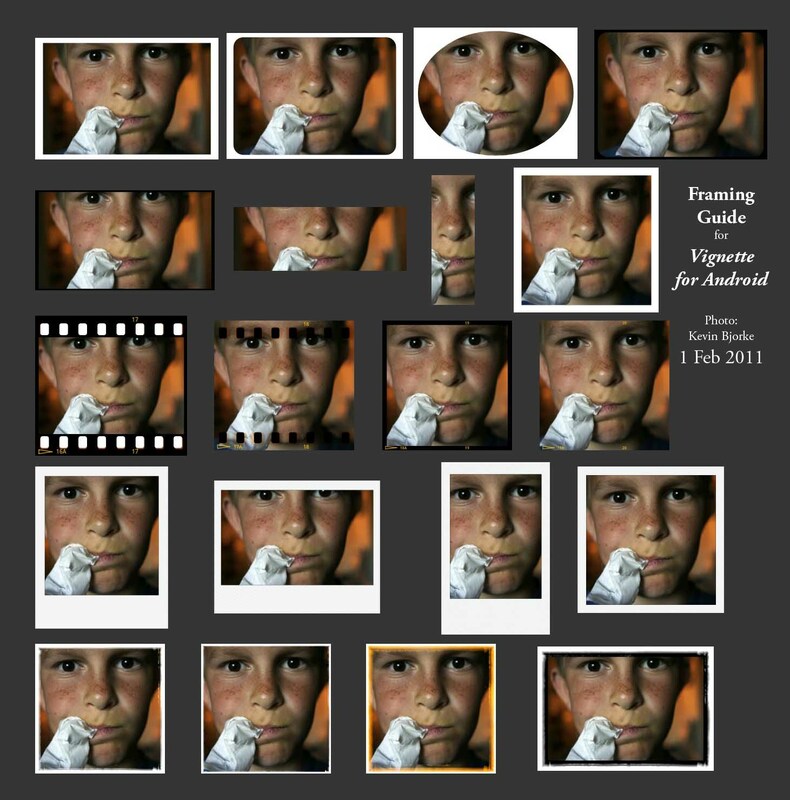 The advent of processing tricks in the camera application collapse the first two steps into one. Just set the camera on "Velvia" and go find some fall foliage. Heck, put the processing and border-generating on "shuffle." Or even shoot with a different camera and import the images into your phone, rather than spend $500 on Photoshop: which is just what is happening here -- cited by Leica, no less. Established commercial photographer Laura Rossignol shooting on a D-Lux 5 (aka Lumix LX5), and then (after doing selects in Lightroom) "I like to take the post processing one step further and I will email a finished version to myself so I can open it in the Picture Show iPhone app. It allows you to add interesting effects and frames." I used to think that the transparency or negative was the canonical object. As Ansel Adams wrote about it, the negative was like a musical score, to be interpreted by a darkroom performance for each new print. Throw that idea away. Immediate darkroom-ish styling on the fly: whether you think they're insanely great or sentimentally godawful, they're as fundamental a part of the New Beast's nature as is the thickness of oil paint or a trumpet's high notes. Get used to it, this is still just an early wave. I'll be the first to say that I find most Holga/Diana-wana-be photgraphy cloying and twee and it's pretty rare that even the most earnest results feel like anything more than just a rehash of Nancy Rexroth's "IOWA." So you can imagine my reflex reaction to programs that deliberately "crappify" otherwise-clear, direct images, burying them under just so much mannered noise. And you'd be right, at least about my initial reaction. Why my attitude has changed in the next photorant entry. 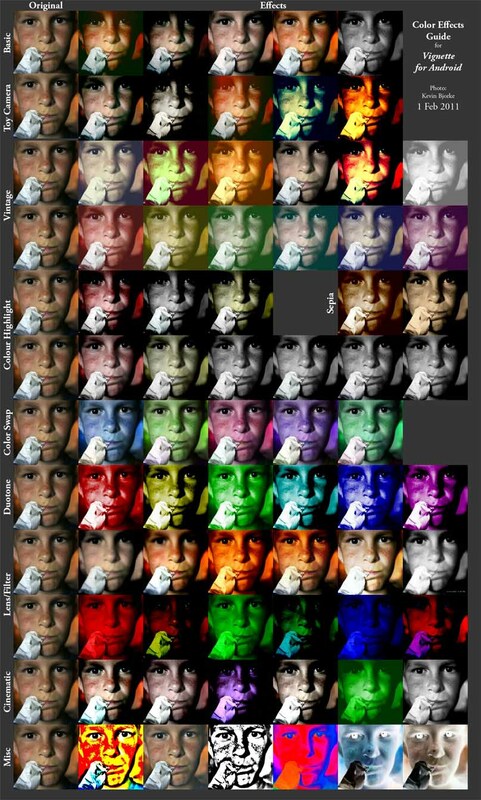 In the mean time, since I couldn't find one that entirely suited me, here are a couple of guides to the color modes (and below, frame styles) offered as presets by the Android camera-phone program Vignette. A similar chart can be found here, but it was missing skin tones).